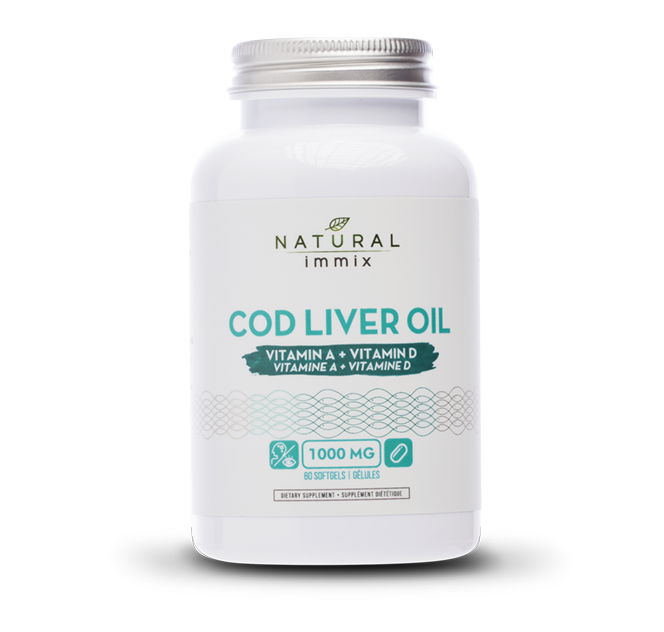 Cod Liver Oil as suggested by the name, is the essential oil extracted from the livers of Atlantic Cod (Gadus morhua) produced from sustainable and healthy stocks to preserve our oceans and the world around us. As a dietary supplement it is a superb source of Omega-3 fatty acids, Eicosapentaenoic Acid (EPA) and Docosahexaenoic Acid (DHA) and also contains a relatively high, natural source of the fat-soluble Vitamins A and D for the maintenance of good health. Cod Liver Oil softgel capsules are produced using an advanced molecular distillation process to protect the purity of the oil and to eliminate any possible chemical contamination. Omega-3's are essential to human health but cannot be manufactured by the body. They are instead found in foods like fish and supplements such as Natural immix Cod liver Oil softgel capsules. Thousands of studies show the benefits of Omega-3 fatty acids for the heart and circulatory system however, many people do not get enough Omega-3 fatty acids in their diet. Two important Omega-3 fatty acids found in cod are Eicosapentanoic Acid (EPA) and Docosahexanoic Acid (DHA). Both of these fatty acids help reduce low density lipoproteins (LDL's) and raise levels of good high density lipoproteins (HDL's). These nutrients also reduce blood vessel constriction, lower fibrinogen (the blood clotting factor), and keep platelets from becoming too sticky. EPA (Eicosapentanoic Acid): is one of several Omega-3 fatty acids used by the body. It is found in cold water fatty fish such as cod. Omega-3 fatty acids are part of a healthy diet that helps lower risk of heart disease. Getting more EPA in your diet has positive effects on coronary heart disease, high triglycerides (fats in the blood), high blood pressure, and inflammation. DHA (Docosahexanoic Acid): is another essential Omega-3 fatty acid found in cold water fatty fish such as cod. Your body needs DHA for the proper functioning of your brain as an adult, and for the development of your nervous system and visual abilities during the first 6 months of life. In addition, Omega-3 fatty acids are part of a healthy diet that helps lower risk of heart disease. Our bodies naturally produce small amounts of DHA, but we must get the full amounts we need from our diet or supplements. Vitamin A: is necessary for the health and protection of eyesight, skin, membranes, and the immune function, and helps in the maintenance and development of healthy bones, teeth and hair. Vitamin A is also important in the protection against viral infections.